We believe in the strong human-animal bond that has driven us to become the world’s foremost authority on ferret nutrition. We’re constantly pushing for the highest quality ingredients for our diet and are always seeking ways to serve our customers and their pets better. Feeding a ferret a high-quality diet can help extend the life of your ferrets. We’ve seen it first hand because we’ve tried all other brands on the market. It’s our goal is to provide you and your ferret a high-protein diet that’s easily digestible and delivers the highest amount of nutrition. Each ingredient is sourced in the United States. We’ve done our research. 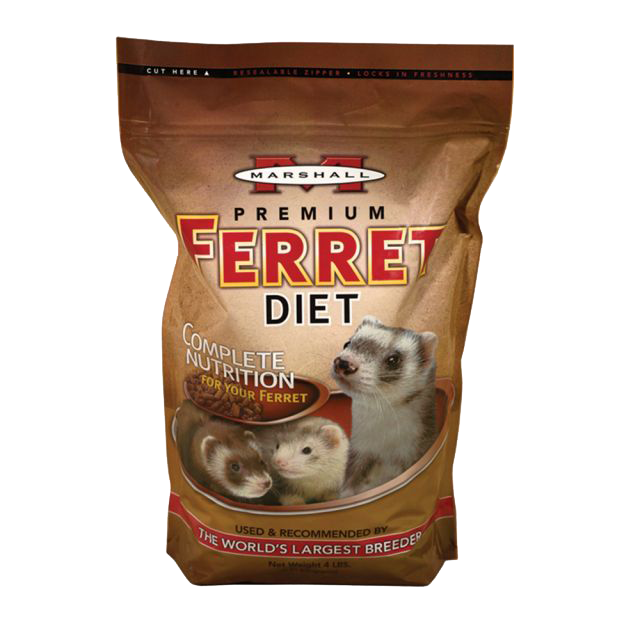 Our diet was developed by a respected team of veterinarians, nutritionists, and ferret experts. It has a high protein content and ideal balance of essential amino acids, making it the perfect diet for ferrets in all stages of life. Our diet is hand-crafted in small batches using a patented low heat process that retains vital nutrients that other diets don’t. We also use fresh chicken. In fact, it takes 3 lbs of fresh chicken to make every 4 lb bag. Did you know that most other ferret food is made in huge batches and stored in warehouses for months at a time? Most of our bags of diet that you find in the store were made within 30 days of the purchase, so freshness is always guaranteed. Our first three ingredients are chicken. We use chicken by-products (organs only) because the amino acids are more prevalent in the organ meats than any part of the chicken. Organ meats also mimic a ferret’s diet in the wild. Animals of prey usually pick body parts to balance their nutritional intake. In long-term studies, corn provides a strong complement to protein sources while also promoting digestive health. We use corn as a binder to keep the pellets from breaking down in the package. It’s a small amount compared to our key ingredient, chicken, and it will not harm your ferret. Beet Pulp is considered to be the finest source of fiber for ferrets. It contains both soluble and insoluble fiber to help support a healthy digestive system. We know that every ferret is different. That’s why we offer three high-quality foods for complete and balanced nutrition for every stage of your ferret’s life. Our flagship formula has 38% protein and an ideal balance of essential amino acids, making it the perfect diet for ferrets. It’s highly digestible with little carbohydrates and is moderate in fats. All Marshall Ferret babies start their new life on Marshall Premium Ferret Diet. 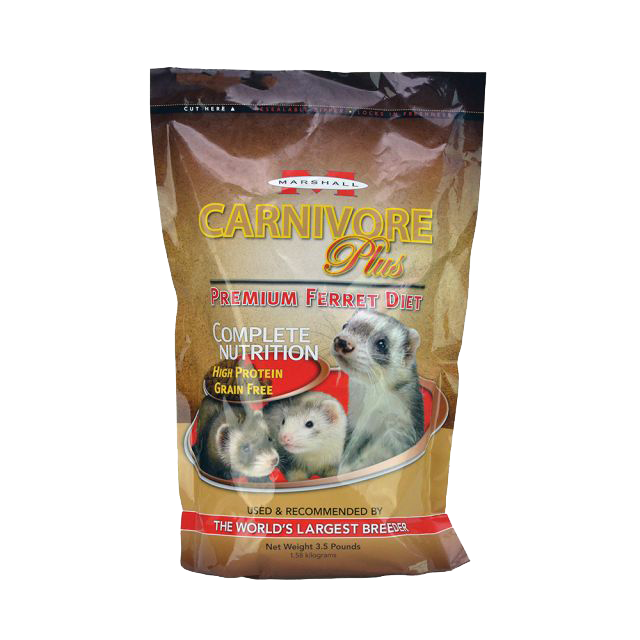 When it comes to ferret health, protein is the word of the day, and our signature diet is packed with 40% protein. Like our other diet, Carnivore Plus features fresh chicken as its #1 ingredients and contains Omega 3 and 6 fatty acids for healthy skin and a shiny coat, with added vitamins and minerals for increased immune support. It’s grain-free, GMO-free and gluten-free, with no fillers, wheat, soy, or sprayed-on rendered fat. It’s everything a ferret diet should have and nothing it shouldn’t. Ferrets love the taste of fresh chicken, and our Select Chicken Formula is perfect for the fussiest of ferrets who have discerning palates. It’s an excellent source of nutrition for ferrets of any age, rich in Omega 3 and amino acids for healthy skin and a shiny coat. Just like senior people and dogs, senior ferrets have special dietary needs. 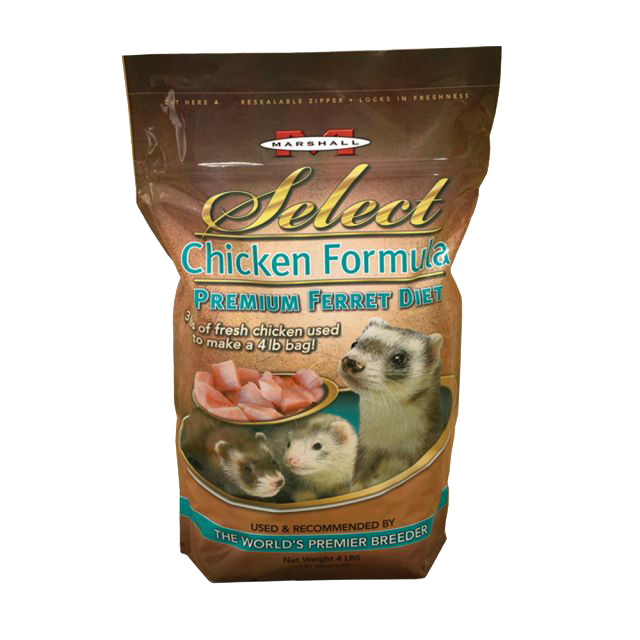 Made especially for ferrets ages four years and up, this formula delivers a tasty dietary staple that fits the bill. 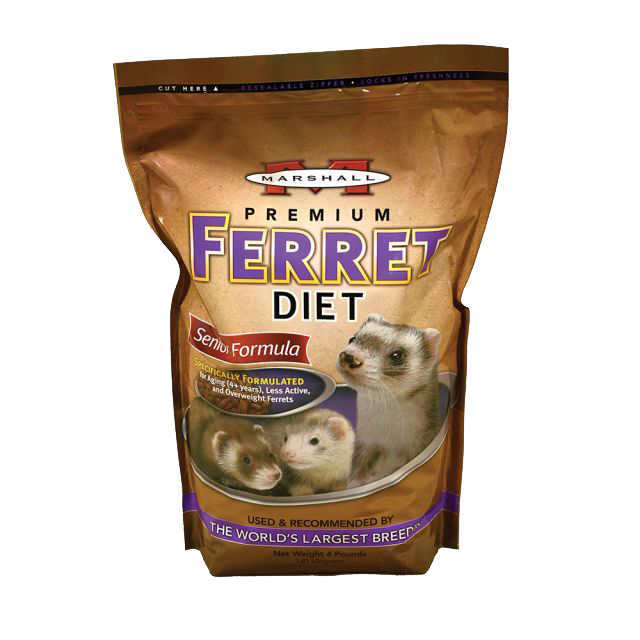 Formulated with 10% less fat and protein than the original Premium Ferret Diet, it helps keep ferrets happy, slim and healthy well into their golden years. This special formula is also an ideal choice for overweight and less active ferrets. Marshall Premium uses more fresh meat protein than any other ferret food. In fact, it takes 6 lbs of fresh chicken to make a 7 lb bag. Marshall processes the fresh meat ingredients with a patented slow cook and vacuum drying process that protects the nutritional integrity of the food. The fat used in the Marshall Premium Diet is derived from the fresh meat; it is not a secondary added fat like most other diets. Marshall does use corn as an excellent carbohydrate source to compliment the high meat content. Although ferrets need very little plant-based carbohydrate, they still need some to prevent serious long term health problems. Marshall Ferret Diet moistened is excellent for growing and developing ferrets. It is also preferred for ferrets that may have been ill or are recovering. Marshall Pet never stops seeking ways to better serve customers and their pets, and consumer input has helped us improve our premium ferret diet formula. We’ve increased the amount of poultry to enhance ferrets’ growth and overall health while limiting concerns about odor. The increased amino acid profile improves digestibility, and the new formula maintains the highest level of quality and freshness that Marshall Pet customers have come to expect. Does the new formula cost more? The change allows us to maintain a consistent price. Why do the pellets look different? The new formula has resulted in a slightly lighter color, but the high quality has not changed. How did you reduce the odor? We have decreased the level of fish protein. To maintain the high protein levels, we increased in poultry organ meat, which improves the formula’s amino acid profile. How does the new formula affect the product's overall level of protein? We use more fresh meat protein than any other ferret food. In fact, it takes 6 lbs. of fresh chicken to make a 7 lb. bag. Our patented slow-cook and vacuum drying process protects the nutritional integrity of the food. Can you guarantee the quality of the new formula? Yes. For more than 75 years, Marshall has been the premier breeder of world-class baby ferrets. We are experts in nutrition for all stages of a ferret's life, and no other manufacturer has this experience or knowledge. Is corn included in the formula? Why do you use corn filler? Marshall does use corn as a source of carbohydrate to complement the high meat content. Research has shown and experience proves that corn is an excellent carbohydrate when formulated properly, which helps prevent serious long-term health problems. Is there a Marshall diet formula that is grain free? Marshall has developed a new ferret diet called, Carnivore Plus. Carnivore Plus is grain free and gluten free and made with fresh chicken as the #1 ingredient. It's packed with nutrients and amino acids preserved by our slow-cook process.